Cedric Haywood. Image available on the Internet and included in accordance with Title 17 U.S.C. Section 107. HAYWOOD, CEDRIC O. (1914–1969). 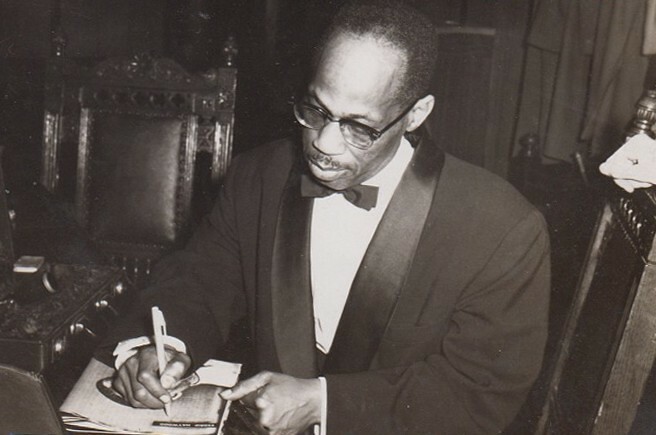 Arranger and pianist Cedric Haywood was born in Houston on December 31, 1914. He was the son of Joseph Haywood and Matilda (Harris) Haywood. Haywood worked in his hometown with the Milt Larkin band from 1935 to 1940. This band included such important jazz figures as Illinois Jacquet and Arnett Cobb, both of whom joined the Lionel Hampton Orchestra after 1940, as did Haywood in 1941. Haywood rejoined Larkin in 1942 and in the same year performed with Sidney Bechet. He served in the army during World War II. From 1948 to 1951 he was a member of Illinois Jacquet's group, which in 1950 recorded Haywood's tune "Hot Rod." In 1952 Haywood worked with the Cal Tjader Quartet in California, and in 1955 he joined up with Kid Ory, touring Europe twice with this traditional trombonist. In the early 1960s Haywood worked with tenorist Brew Moore, after which he returned to Houston, where he led his own band from 1964 until his death. He died in Houston on September 9, 1969, and is buried in Houston National Cemetery. Handbook of Texas Online, Dave Oliphant, "HAYWOOD, CEDRIC O.," accessed April 23, 2019, http://www.tshaonline.org/handbook/online/articles/fhagc.